Feeling the heat of the competition, Honda has introduced a celebration edition of Amaze sedan and Mobilio MPV. 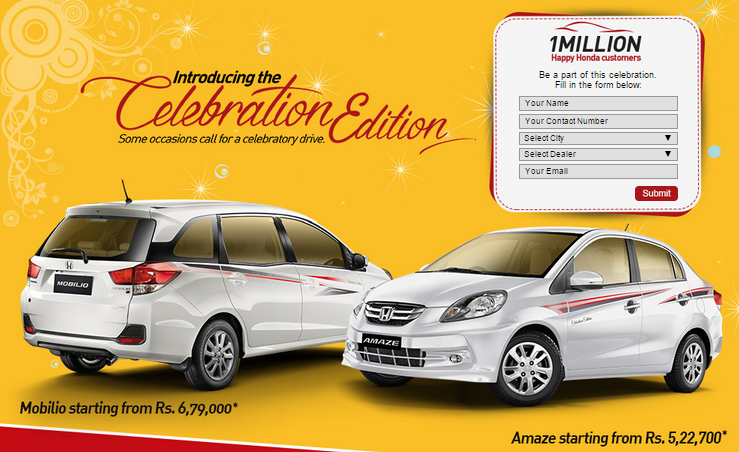 As per Honda the celebration editions have been launched to commemorate the festive season in India. The Amaze which was the king in the segment is threaten by the recently launched Ford Figo Aspire and the Mobilio from Renault Lodgy which has received lot of attention by the Indian customers. The celebration edition vehicles will get upgraded seat covers and cushions, a steering wheel cover, new floor mats, body graphics and a logo to highlight the special edition. The offer is available in all variants and only in Tafetta white and Orchid Pearl White pain schemes. The celebration edition Honda Amaze price starts from Rs. 5,22,700 and Mobilio at Rs. 6,79,000 (Ex-showroom, Delhi).